2:18-29: "To the angel of the church in Thyatira write: These are the words of the Son of God, whose eyes are like blazing fire and whose feet are like burnished bronze. I know your deeds, your love and faith, your service and perseverance, and that you are now doing more than you did at first. Nevertheless, I have this against you: You tolerate that woman Jezebel, who calls herself a prophetess. By her teaching she misleads my servants into sexual immorality and the eating of food sacrificed to idols. I have given her time to repent of her immorality, but she is unwilling. So I will cast her on a bed of suffering, and I will make those who commit adultery with her suffer intensely, unless they repent of her ways. I will strike her children dead. Then all the churches will know that I am he who searches hearts and minds, and I will repay each of you according to your deeds. Now I say to the rest of you in Thyatira, to you who do not hold to her teaching and have not learned Satan's so-called deep secrets (I will not impose any other burden on you): Only hold on to what you have until I come. To him who overcomes and does my will to the end, I will give authority over the nations-- `He will rule them with an iron scepter; he will dash them to pieces like pottery' -- just as I have received authority from my Father. I will also give him the morning star. He who has an ear, let him hear what the Spirit says to the churches. Thyatira was located around 45 miles east of Pergamum. While not a great city, it was known for commerce in wool, linen, and dyed cloth. It had an extensive network of trade guilds each having its own patron deity accompanied by feasts and festivals which included sexual revelries. Act’s 16:14 mentions Lydia from Thyatira, a maker of purple cloth. Christ identifies Himself as the Son of God and congratulates this church on doing more now than at the beginning. Christ then shows His great displeasure at this church for allowing the women Jezebel to pervert the church. It is generally felt that use of the name Jezebel is symbolic of the infamous Jezebel of OT history who led Israel into idolatry. It is theorized that because Thyatira was virtually dominated by trade guilds, you had to be a member of such guild in order to work. These guilds all had patron deities to which you were expected to give honor and participate in their worship practices which included sexual misconduct. It is felt that there was someone in the Thyatira church encouraging accommodation to such practices which led to moral sin and idolatry. Christ is seen as facilitating judgement upon those doing these things and promising ruling authority to those who remain faithful. Some Futurists view the Thyatira church as representative of the Christian Church between A.D. 500 and A.D. 1500 which is the time the papacy became a powerful influence. While Futurists see evidence for a literal first century application of the conditions extant at Thyatira, they also see prophecy of events that they feel can only be realized at a yet future return of Christ to establish His Kingdom with the resurrected saints. Futurists see Christ promising Thyatira power over the nations and ruling them with a rod of iron and dashing them as a potter’s vessel. They look at the present and past state of the world and conclude there is no evidence that this has taken place and therefore it must still be future in fulfillment. The Preterist sees no evidence to conclude that Thyatira or any of the seven churches addressed by Christ are representative of specific Church ages, or the Church as a whole throughout history up to the present. Preterists see Christ addressing seven churches that history shows existed in the first century. They see Christ addressing problems that history indicates match well with the particular cultural, political, religious and environmental circumstances these churches found themselves in. Preterists point out Jesus told the Christians at Thyatira to “hold on to what you have until I come.” He told the Philadelphia church “I am coming soon.” The Preterist asks what relevance this would have to these first century Christians if Christ wasn’t coming for thousands of years after they all died. The Preterist believes that Christ came as He said He would and established not a physical but a spiritual Kingdom which began in the first century as a “mustard seed” and has continued to grow through the ages, increasing in power and rule over the nations as promised to the Thyatira church. Preterists also believe that a first century return of Christ in judgement of Israel brought to an end the Old Covenant system and gave immediate power to Christians to finally remove the yoke of Jewish persecution off their collective back. This is believed to be the “end” spoken of by Christ to Thyatira as well as on numerous other occasions in the NT narrative. 1-6: "To the angel of the church in Sardis write: These are the words of him who holds the seven spirits of God and the seven stars. I know your deeds; you have a reputation of being alive, but you are dead. Wake up! Strengthen what remains and is about to die, for I have not found your deeds complete in the sight of my God. Remember, therefore, what you have received and heard; obey it, and repent. But if you do not wake up, I will come like a thief, and you will not know at what time I will come to you. Yet you have a few people in Sardis who have not soiled their clothes. They will walk with me, dressed in white, for they are worthy. He who overcomes will, like them, be dressed in white. I will never blot out his name from the book of life, but will acknowledge his name before my Father and his angels. He who has an ear, let him hear what the Spirit says to the churches. Sardis was located around 30 miles south of Thyatira. It was a prosperous city and had a temple to Artemis situated on the acropolis, an 800 foot high rocky elevation on the north side of the city. The city was known for its red dye and woolen industry. Its population was taken up with luxurious living which led to moral decadence. The scriptures do not reveal what was going on in Sardis for Christ to label them as dead. They were living in a city of wealth and relaxation and may have been simply going through the motions of Christianity but not really maintaining the kind of separation from the world that Christ requires. Futurists view Christ’s statement in this passage about coming as a thief as a statement of unannounced judgement upon those members of the Sardis church who fail to change their ways. Futurists feel Christ’s statement here about coming as a thief is unrelated to statements elsewhere in scripture about His second coming being like the coming of a thief. Some Futurists see Sardis as representing the church age during the reformation period of A.D. 155 to A.D. 1700. Other Futurists see the conditions extant in Sardis and all seven churches as representative of conditions within the church throughout history. Since each message to the churches ends with promises associated with events seen as related to the second coming, it is felt that these promises won’t be realized by the church until the “church age” ends with the return of Christ in the future. Preterists see the statement about Christ coming as a thief as parallel to what He said about his second coming being as the coming of a thief in Revelation 16:15. Preterists point out that the second coming is discussed by Jesus within the context of coming as a thief in the Olivet Discourse. Paul, in his second letter to the Thessalonian church (2 Thessalonians 5:2-4), characterizes Christ coming as a thief and Peter does the same in 2 Peter 3:10. Since it is the second coming and not some other coming that is associated with coming as a thief throughout the scriptural narrative, Preterists conclude it is the second coming that is alluded to in the message to the Sardis church. Preterists see Jesus Christ addressing first century Christians and telling them to wake up so his coming won’t surprise them. 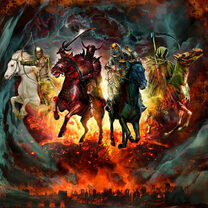 Preterists point out that the entire Revelation is about the second coming of Christ. That being the case, Preterists ask why would Jesus speak of some other kind of coming in his admonition to the Sardis church or any of the seven churches. It’s pointed out that Jesus plainly said at the beginning of the Revelation that His message to his servants was about what must soon take place (Revelation 1:1). The second coming was the major event that was to soon take place. 7-13: "To the angel of the church in Philadelphia write: These are the words of him who is holy and true, who holds the key of David. What he opens no one can shut, and what he shuts no one can open. I know your deeds. See, I have placed before you an open door that no one can shut. I know that you have little strength, yet you have kept my word and have not denied my name. I will make those who are of the synagogue of Satan, who claim to be Jews though they are not, but are liars--I will make them come and fall down at your feet and acknowledge that I have loved you. Since you have kept my command to endure patiently, I will also keep you from the hour of trial that is going to come upon the whole world to test those who live on the earth. I am coming soon. Hold on to what you have, so that no one will take your crown. Him who overcomes I will make a pillar in the temple of my God. Never again will he leave it. I will write on him the name of my God and the name of the city of my God, the new Jerusalem, which is coming down out of heaven from my God; and I will also write on him my new name. He who has an ear, let him hear what the Spirit says to the churches. Philadelphia was located about 25 miles southwest of Sardis. It was founded between 189 and 138 B.C. and named after King Attalus 2nd of Pergamum who had been given the name “Philadelphus” (brother lover) because of his love for his brother. The city was prosperous and associated with textiles, leather works and wine making. Christ seen as holding the key of David appears to be associated with the account of Eliakin who was given the responsibility of determining who could enter the Kings residence and who would be denied entrance. In reference to Eliakin, Isaiah quotes God as saying, “I will place on his shoulder the key to the house of David; what he opens no one can shut, and what he shuts no one can open.” (Isaiah 22: 22). Some commentators feel what Christ is saying to the Philadelphia church is that he has placed before them an open door to the Kingdom and since He controls the door no one can open or shut it without His approval. It is speculated that Judaizers were infiltrating the Philadelphia church teaching Christians that only through keeping the Mosaic regulations could they enter the Kingdom. Christ looks upon these Judaizers as belonging to the synagogue of Satan just as in His directives to the Smyrna church. Futurists see the Philadelphia church as representative of a period of time shortly before a yet future return of Christ. Some Futurists see Christ’s open door statement as not pertaining to entering the Kingdom but as an invitation to spread the gospel message to the world. Those futurists who believe in church eras feel the Philadelphia church represents the period from around A.D. 1700 to the present as a period of great evangelism. Christ’s statement about keeping them from the hour of trial that will come upon the whole world is seen as being a yet future event as Futurists do not see this historically occurring. Futurists conclude Christ is telling the Philadelphia church that He will remove (rapture) them from the earth and therefore cause them to avoid the great tribulation. Preterists respond by again pointing out that this message is written to an existing first century church and must have relevance to that church. It’s pointed out that the Revelation was given to show the servants of God what must soon take place. This message was written 2000 years ago and directed to first century servants of God residing in seven different churches existing at that time. The Preterist will turn to dozens of NT scriptures which show expectation of an imminent return of Christ. Preterists will point to a very instructive statement made by the writer to the Hebrews. Hebrews 10: 36-37: You need to persevere so that when you have done the will of God, you will receive what he has promised. For in just a very little while, "He who is coming will come and will not delay." Preterists see no delay in what Christ tells the church at Philadelphia. They had patiently endured and were about to be protected from the coming tribulation and judgement upon Israel and receive the promised salvation and entrance into the Kingdom. Preterists see Christ’s statement about the hour of trial coming upon the whole world as referring to the Roman world of the first century which was going through severe political, cultural and social turmoil. It was also a time of great tribulation for the church which had to withstand persecution from the Judaizers and martyrdom at the hands of Rome. Christ tells the Philadelphians He is coming soon. Preterists see this as being addressed to the first century church in the city of Philadelphia and not to a twenty-first century representation of that church. Christ’s coming is therefore seen as imminent to first century Christians. Preterists see no scriptural or historical justification for elasticizing Christ’s statement about coming soon to thousands of years into the future and counting. 14-22: "To the angel of the church in Laodicea write: These are the words of the Amen, the faithful and true witness, the ruler of God's creation. I know your deeds, that you are neither cold nor hot. I wish you were either one or the other! So, because you are lukewarm--neither hot nor cold--I am about to spit you out of my mouth. You say, `I am rich; I have acquired wealth and do not need a thing.' But you do not realize that you are wretched, pitiful, poor, blind and naked. I counsel you to buy from me gold refined in the fire, so you can become rich; and white clothes to wear, so you can cover your shameful nakedness; and salve to put on your eyes, so you can see. Those whom I love I rebuke and discipline. So be earnest, and repent. Here I am! I stand at the door and knock. If anyone hears my voice and opens the door, I will come in and eat with him, and he with me. To him who overcomes, I will give the right to sit with me on my throne, just as I overcame and sat down with my Father on his throne. He who has an ear, let him hear what the Spirit says to the churches." Laodicea was located about 45 miles southwest of Philadelphia. It was a banking center and known for production of black woolen products. It had a famous medical school and was known for the production of an effective eye salve made from Phrygian powder mixed with oil. The city was considered wealthy and had a sizable Jewish population. Despite its wealth, its water quality was poor. The city’s water supply originated from hot springs six miles away and in the process of traveling through aqueducts to the city, the water became tepid, neither hot nor cold. The parallels between what Christ said to this church and the actual physical circumstances of the residents of this city are striking. Being neither hot nor cold corresponds to the drinking water of the city. The acquisition of wealth reflects the wealthy status of the city. The admonition to buy gold refined in fire so they could wear white clothes is in contrast to the black wool clothes that were worn. The counsel to apply spiritual eye salve associates with the physical eye salve for which this city was known. Preterists see these parallels and find them to be very strong evidence for a first century application of this scripture to the church at Laodicea. The Futurist sees the first century application but feels it also applies to conditions extant in the church just before a yet future return of Christ. The Preterists asks what justification is there for such futuristic application. Futurists view the message to the seven churches as representative of conditions within the church in specifically defined periods of church history or representative of the church in general throughout its history. While acknowledging the historical existence of the seven churches in the first century, it is believed that the directives to those churches are prototypes or shadows of what would be extant within the church right up to the time of a yet future return of Christ. Preterists see Christ addressing seven first century church congregations about problems relevant to them. Preterists point out that Christ repeatedly speaks of the imminent fulfillment of the events of which He speaks. Preterists see no scriptural or historical evidence to turn plain statements of imminency on their head and make them to mean the opposite of what they mean. Preterists acknowledge that some conditions extant in these seven churches can be seen in the Church throughout its history. Drawing such parallels, however, does not equate with Christ’s statements being predictive or intended prototypes of such parallels. Parallels are stand alone comparisons and do not require any causal association with their antecedents. Preterists see Futurists as assuming the thing to be proved by postulating future fulfillment of the message to the seven churches in order to maintain their expectation of a yet to occur return of Christ. Preterists see Futurists assigning “double speak” to statements of Christ in concluding that when Christ says near He really means far and when he says soon He really means distant. Preterists, admonish Futurists to simply take the statements of imminency to mean what they say, place the scriptures in their historical context and let the chips fall where they may.